In the background of the two programs IrpMaster and IrMaster, the work reported herein is to some extent obsolete, in particular the IR protocol descriptions. In the near future, I intend to restructure this project slightly, possibly splitting it in several subprojects. The current "release", called 0.7.0, is really nothing but a snapshot to support IrMaster. It differs from 0.6.0 in particular since the peculiar IR engine has been replaced by IrpMaster, but also through a number of small fixes. 2009-07-18 Initial version, as harc.html. 2011-01-10 Restructured. Main part now called harctoolbox_doc.html. 2011-04-29 Somewhat updated. The document is presently not quite up-to-date, see the fixme section. The present document is aimed more at a high-level description of the system, rather than being a user's manual. It describes most aspects of Harctoolbox at most very roughly. Much is not described at all. Some information in this file may even refer to the previous version, and no more be accurate. The "system" consists of a number of data formats, and Java classes operating on those formats. It has been the goal to formulate file formats allowing for a very clean description of infrared protocols, the commands of devices to be controlled (in particular, but not exclusively audio- and video equipment), networking components, topology of an installation, as well as macros. From these very general universal formats configuration files in other formats, used by other systems, can automatically be generated. Directly supported communication hardware and software are GlobalCache GC-100, IRTrans LAN (only the LAN version is supported directly), RS232 serial communication through the GlobalCaché or ser2net, TCP sockets, HTTP, RF 433 and 868 MHz through EZcontrol T10 as well as through an IR->RF translator like Conrad Eggs or Marmitek pyramids. Indirectly, through LIRC, a vast number of IR senders are supported. Next a somewhat technical description of the file formats will be given. These are all defined in the form of XML files with a rather strict DTD. The discussion to follow will focus on the concepts, not on the details. Of course, the semantics of the files are defined by the DTD file. Necessary theoretical background on IR signals can be found for example in this article. Harctoolbox has higher requirements on the data quality of its input files than other related projects. For example, in LIRC, a configuration file consists of a device name, and a number of commands with associated IR signals. The names of the commands there are in principle completely arbitrary, and it appears to be common to try to follow the vendor's naming. In Harctoolbox, there is instead a fixed (but of course from the developer extensible) list of command names, intended to uniquely denote a command for a device. A command name in principle is a verb, not a noun, and should describe the action as appropriate as possible. There is, for example, no command power, instead there are three commands: power_on, power_off, and power_toggle (having the obvious semantics). Also, a command which toggles between play and pause status may not be called play, but should be called play_pause. The names are defined in the XML file commandnames.xml, from which a Java enum command_t is created through an XSLT style-sheet mk_command_t.xsl. Further rules for command names are found as comments in that file. This section is obsolete. The IR engine has been replaced by IrpMaster. By "(infrared) protocol" we mean a mapping taking a few parameters (one of those a "command number", one a "device number", sometimes others) to an infrared signal. A protocol file is an XML file describing exactly how the IR signal is made up from the parameters. The format is quite close to an XML version of the "IRP notation" of the JP1-Project. It is a machine readable description on how to map the parameters into a modulated infrared signal, consistent with a technical description. The protocol is identified by its name. A protocol takes a certain number of parameters, although sometimes one is defaulted. At his point, the reader may like to compare this prose description of the protocol we (and the JP1 project) call nec1 with the XML code in nec1.xml. Note that our description, using an arbitrary subdevice number, corresponds to the author's "Extended Nec protocol". The naming of the different protocols is of course somewhat arbitrary. In general, I have tried to be compatible with the JP1-Project. It can be noted that the supported radio frequency protocols are nothing but IR-signals with the carrier consisting of infrared 950nm light substituted by suitable radio carrier, typically of 433 MHz. Ideally, most users should not have to worry with the protocol files. This is only necessary when introducing a device with a IR-protocol that has not yet been implemented. At the time of this writing the 17 protocols have been implemented, this covers the most important ones, but not all known to e.g. the JP1 project. A device file is an XML file describing the commands for controlling a device. 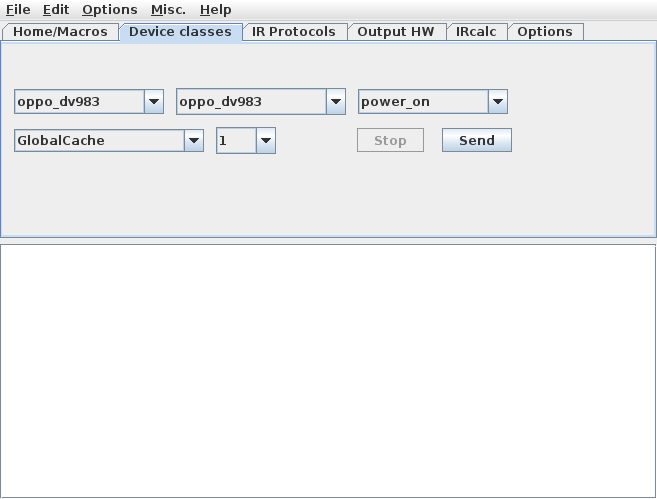 In Harctoolbox a device file truly describes the device and its commands, stripped from all information not pertaining to the very device, like key binding on a remote, button layout, display name, the IR blaster it is connected to, location, IP-address, MAC-address, etc. (This is in contrast to many other systems, like Pronto CCF-files or JP1 device updates). There may be many different types of commands for the device, like IR, RF signals (this is, at least for the few cases presently supported, nothing else but IR signals with the infrared light as carrier replaced by an radio signal, for Europe of 433 or 868 MHz frequency), commands over serial RS232 interfaces or TCP sockets, or utilizing a WEB API. Also "browsing" the device (pointing a Web browser to its www server), pinging and sending WOL-packages are considered commands, as well as suppling power, sometimes "in reverse direction" (like a motorized blind going up or down). Possibly the same command can be issued over different media. Some commands may take arguments or deliver output. For this (and other) reasons, care should be taken to use the "correct" command names, not just a phrase the manufacturer found cool. Commands are grouped in commandsets, consisting of commands having its type (ir, serial, tcp,...), device number etc in common. IR signals within a device file may contain codes in Pronto CCF format in addition (or instead) if the structured information (protocol, device number, command number etc). Actually, "exporting in XML format" means generating an XML file augmented with the raw CCF codes. In may cases, also so-called cooked Pronto codes (Background, written by remotecentral) are included, as well as JP1 protocol information. The device configuration file is processed by an xinclude-aware parser, allowing a certain include-file structure, that can be used to structure the data. As an example, consider the Oppo DV-983HDVD player with serial support. This is supported by Harctoolbox with the file oppo_dv983.xml. Its commands can be downloaded directly from the manufacturer (hats off! ), both the infrared and the serial commands. As can be found in the spreadsheet on the IR code, the device uses the previously mentioned nec1 protocol, with device number equal to 73. This corresponds to the first command set in the mentioned device file. The serial commands form another commandset, subdivided into commandgroups, depending on whether they take an argument and/or deliver output. 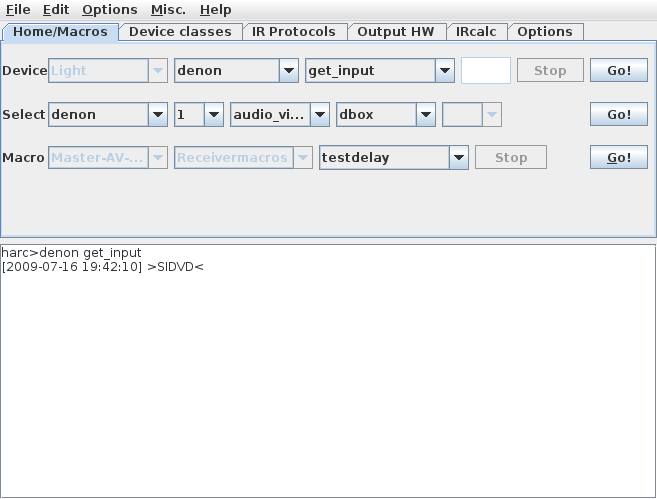 Note that some commands (for example play) are available both as IR and as serial commands. Other interesting examples are the *_dbox2.xml files (referring to the German dbox with the open source tuxbox software) , each containing two (sagem_dbox2.xml, philips_dbox2.xml), or three (nokia_dbox2.xml) different infrared command sets as well as an elaborate web-api command set. Another very interesting example is the Denon A/V-Receiver denon_avr3808.xml having several infrared command sets using the denon protocol (which, ironically, is called the "Sharp protocol" by the firm Denon), as well as several command sets using the denon_k (Denon-Kaseikyo protocol). Then there is a large number of "serial" commands, available through both the serial box as well as through the (telnet) tcp port 23. Since Harctoolbox is so picky with command names and their semantics, the value of an import facility is limited — necessary information is simply not there (or is wrong). There exists a large number of IR signal data in the Internet (for example from LIRC configuration files, JP1 device updates, or the large collection (mainly CCF) of files on Remotecentral. Presently, Harctoolbox has "importers" for Pronto/CCF and JP1's device upgrades in RemoteMaster format. I "sort-of" wrote a LIRC-to-CCF translator a few years ago, possibly I will finish it someday. However, the importers have as their goal to create a first iteration of a device file (not even guaranteed to be valid XML!) to be tweaked manually. Writing an exporter is in principle easier. 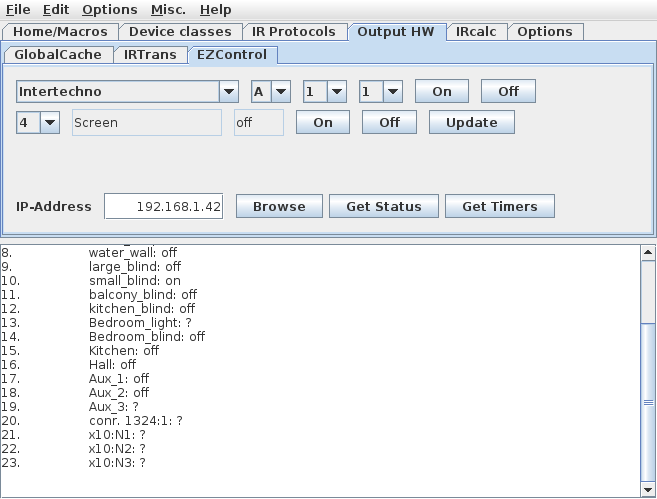 Harctoolbox presently can export the IR signals of a device in CCF format, LIRC-format (either a particular device, or all devices connected to a particular LIRC server defined in the home file), JP1's device upgrades in RemoteManager format, as well as the rem-files used by IRTrans. Individual IR-signals can be exported in wav-format for usage with an audio output driving an IR LED after full wave rectification, see for example this article This feature is presently not available through the GUI. Many other things are possible. I have had some success creating a program that, given an XML configuration file, creates a full JP1-type image that can be flashed on a URC-7781 (that is, not just one or a few device updates). The protocol and device files described up until now are a sort of universal data base — common and invariant to every user, at least in principle. In contrast, the "home file" (possibly the name is not very well chosen) describes the individual setup ("home"). It is a good idea to think of the device files as class definitions, classes which can be instantiated one or more times, in that one or more devices of the same class are present in the home configuration, each having its individual (instance-)name. It is instructive to have a look at the supplied file home.xml at this point. In the home file the different devices are defined as class instances. They can be given alternate names (aliases) and groups can — for different purposes — be defined. For example, this can be useful for generating GUIs taking only a certain group of devices into account. Gateways are defined: a gateway is some "gadget" connecting some other media together, for example, the GlobalCache (among other things) connects the "tcp connector" on the local area network (lan) to its output connectors, which may be e.g. an infrared blaster or stick-in LED controlling an IR-device. Devices that can be controlled declare the said device/connector combination as a "from-gateway", or indirectly as a from-gateway-ref (using the XML idref facility). (Yes, there are a lot of details here which ideally sometime should be described in detail.) Thus, a routing is actually defined: how to send commands to the device in question. Note that there may be many, redundant, paths. The actual software is actually using this redundancy, thus implementing a certain failure-safeness. The actual from-gateways, and their associated paths, are tried in order until someone succeeds in sending the command. (Of course, only to the extent that transmission failures can be detected: non-reachable Ethernet gateways are detected, humans blocking the way between an IR-blaster and its target are not...). There is a great potential in this concept: Consider for example a "Conrad Egg transmitter", which for our purposes is nothing but IR->RF gateway. Assume that a IR stick-on emitter is glued to the egg, and connected to a Ethernet -> IR gateway. If there is, say a RF controlled Intertechno switch, interfacing with an electric consumer, it is possible to just issue the command for turning the electric consumer on or off, and the software will find out that it has to send the appropriate IR signal to the IR gateway. In the previous version, a simple XML macro facility was implemented. In this version, it has been replaced by the incorporating the scripting engined Jython. This is simply a Java implementation of the very popular and wide spread scripting language Python. This approach has some definite advantages to the previous "solution": It is possible for the user to "script" the Harctoolbox engine, "macros", using a well established and documented syntax and semantics. It also gives access to internal Java objects as Python objects (which of course may introduce some problems too...). There is a large number of Java classes operating on the data objects. Some classes operates on protocols, some on device classes (through device files), some on device instances in the sense of the home file. In most cases when it is sensible to call use the class individually, it contains a main-method, i.e. can be called from the command line. In general, there are a number of arguments. A usage message can be generated in the usual GNU way, using --help as argument. where OPTIONS=-A,-V,-M,-C <charset>,-h <filename>,-t ir|rf|www|web_api|tcp|udp|serial|bluetooth|on_off|ip|special|telnet|sensor,-T 0|1,-# <count>,-v,-d <debugcode>,-a <aliasfile>, -b <browserpath>, -p <propsfile>, -w <tasksfile>, -z <zone>,-c <connectiontype>. Using the -g (as well as no argument at all, to allowing for double clicking the jar-file) starts Harctoolbox in GUI mode, described in the next section. Invoking Harctoolbox with the -r, -l portnumber starts the readline and port listening mode respectively. 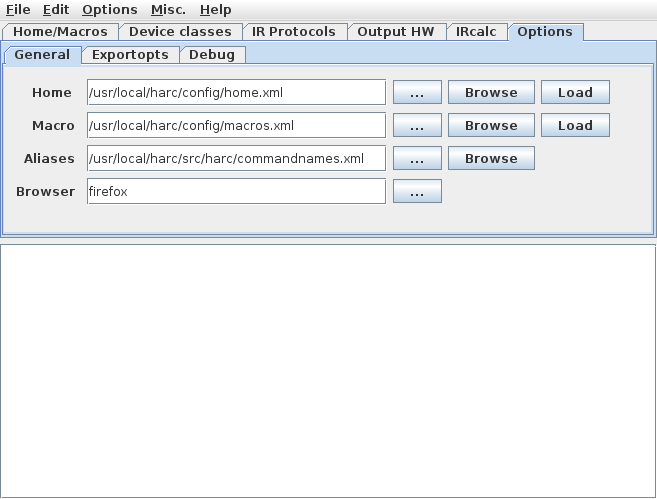 Otherwise Harctoolbox will run in non-interactive mode, executing one command or macro, and then exit. If the -P-argument is given, commands are interpreted by the Python interpreter, otherwise they are interpreted as device command [argument(s)...]. The -s option enables the select mode, described previously. Otherwise, the arguments are considered as a device instance name, followed by a command name, and optionally by arguments for the command. If the command name is missing or "? ", the possible command names for the device will be listed. for codes with toggles (like RC5), set the toggle value to the argument. set debug code. See debugargs.java for its precise meaning. Use -1 to turn on all possible debugging. Normally, aliases (allowing the software accept e.g. "enter" and "select" as synonyms for "ok") are taken from the official command.xml. This option allows the usage of another alias file. Allows using an alternative path to the browser used to invoke browse-commands, instead of the default one. Allows using an alternative properties file, instead of the default one. The "Readline mode" is an interactive command line mode, where the user types the commands one at a time. If GNU readline is available, the extraordinary facilities of GNU readline allows not only to edit present command and to recall previous commands, but also for an intelligent completion of relevant names for macros, devices, and commands. If GNU readline is not available, Harctoolbox's "readline mode" will still work, only these "comfort features" are missing. The semantics of the typed command are like the non-interactive arguments. There are also some extra commands, introduced by "--"; these in general correspond to the command line options described above. The normal command line options are ignored. Starting Harctoolbox in port listening mode starts a multithreaded server, listening for commands on the TCP port given as argument, default 9999. The present version also listens to UDP connections using the same port number. The server responds to a connection on that port and spawns off a new thread for each connection. It listens to commands on that port, sending output back. The semantics of the command line sent to the server is the same as for the non-interactive invocations, with the addition of the commands --quit, which makes the session/thread close, and --die, which in addition instructs the server not to spawn any more threads, but to die when the last session has ended. If the -P-argument is given, the issued commands are interpreted though the Python interpreter. In this case, the default portnumber is 9998. The present GUI was not designed for deployment. It does not offer a user friendly way for allowing a nontechnical user to control his home or home theater. Rather, the goal was a research-type GUI, to allow the expert user to access to most of the functionality of the Java classes, without having to look in the Javadoc class documentation. Hopefully, in the near future, there will be one or more "cool" GUIs for the system. This need not be additions to the present system, but rather integrations with other technologies and projects, like Openremote. The main properties of the present GUI will be described next. The GUI consists of a title bar with pull-down menus for File, Edit, Options, Misc., and Help. These are believed to be more-or less self explanatory. There are six panes, that will be described in order. Many interface elements have a short tool-text help messages, which are displayed when the cursor is hoovering above the element. The lower part of the main window is occupied by "the console". The latter is a read-only "pseudo paper roll console", listing commands, tracing- and debugging information as directed by the user's selections, as well as command output and error messages. Except for the mandatory about-popup (which is of course non-modal! ), popups are not used. The GUI resides almost completely within the file gui_main.java. It was designed using the Netbeans IDE version 6.5. This pane corresponds to using Harctoolbox through the Home configuration file. Devices, using their instance names as defined in the home configuration file are sent commands, possibly with one argument, possibly returning output in the console. (Commands taking two or more arguments cannot be sent through the GUI.) The first row is for sending commands to devices, the second for the select mode, while the third one can execute macros. Note that both the execution of macros and of commands are executed in separate threads. This pane is the only one coming close to "deployment usage". The other panes can be useful for setting up a system, defining and testing new devices or protocols, or for "research usage". This pane allows for sending infrared signals (no other command type!) to the using either a GlobalCache or an IRTrans, that has been selected using the "Output HW" pane, including output connector to use. The home configuration file is not used. The devices are called by their class names. This pane has more of research character. 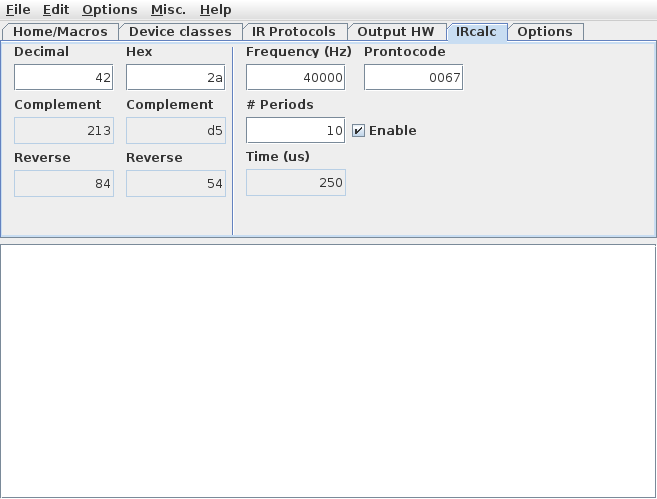 For a protocol in the protocol data base, a device number, possibly a subdevice number, and a command number is entered, pressing the "Encode" button causes the corresponding IR code in Pronto CCF format to be computed and displayed. Pressing the send button causes the code to be sent to a GlobalCache or IRTrans that was selected in the "Output HW" pane. Note that it is possible to hand edit (including pasting from the clipboard) the content of the raw code before sending. Whenever there is content in the raw code text area, the decode button can be invoked, sending the content to the DecodeIR library, thus trying to identify an unknown IR signal (if possible). Log files from the Irscope program (using .icf as their file extension) can be imported using the icf button. There presently appears to be some "glitches" in the button enabling code; click e.g. in the "raw code" text area to enable buttons that are incorrectly disabled. 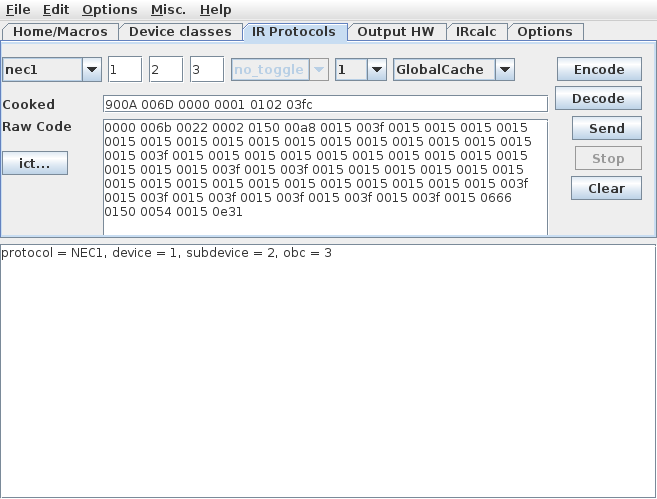 This pane has three subpanes: GlobalCache (for selecting the GlobalCache, and its output connector, used on the Device classes and on the IR Protocols pane), IRTrans (dito), and EZControl. The latter is sort of an interactive toolbox for the EZcontrol T10, allowing to send different commands, inquiry the status of one or all of the preselected switches, as well as getting a list of its programmed timers. This pane allows the user to set a few more options. On-off options are sometimes instead available through the Options pull-down menu. Harctoolbox uses a properties file in XML format. For some of the properties there is no sensible access in the GUI. For this reason, it may therefore sometimes be necessary to manually edit this file with a text editor (or XML editor).